We are so excited to announce that our feature is about.. Grand Velas Los Cabos Resort! If you are looking for a luxurious property that is not only upscale but has everything you need for a destination wedding, you’ve come to the right place. Below, we have some highlights and some of their best amenities to show off today. Let us know if you have any questions in the comments. 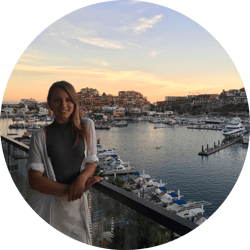 As you can tell from our latest blog posts, we love Los Cabos. Not only does it have beautiful beaches and weather all year round, but the landscape is truly unique. Grand Velas Los Cabos Resort has a fabulous beachfront, and the sunsets are spectacular. You and your guests will always have opportunities for fun and relaxation. Now, as a 5-star resort, you know the suites are going to be excellent. The colour scheme, view, and amenities make your stay feel like you are truly in paradise, which makes Grand Velas Los Cabos Resort stand out. Watch the sun rise or set right from your door, not to mention the 24/7 room service you will take advantage of during your stay. It will be romantic, luxurious, and comfortable, which is the perfect combination. You and your guests will have plenty of time for entertainment and amenities for you to escape into paradise. This resort is a family-friendly facility, which means that they have vast areas set up to distract the kids! Whether it’s the Kid’s Club, Teen’s club, or daily activities, the kids in your wedding group will love there time here. For the adults, enjoy the spa, three-tiered infinity pools, and locations dedicated just for you. Your entire wedding party will love exploring the property and take part in great activities throughout their stay. The staff is there to ensure that your destination wedding runs smoothly and every moment is an amazing one. When I was talking to our staff about the dining options here, there was nothing but positive feedback. The chefs and meal options are to die for here. You and your guests will choose between classic cuisines such as seafood, French, Italian, and of course, Mexican. You will never go hungry here and even your most picky guests will find something to love. These spaces are also beautifully designed, which means they make perfect locations for cocktail dinners and rehearsal dinners. Lastly, one of the most common stresses with a destination wedding is coordinating with the wedding planner. You will not have this problem at Grand Velas Los Cabos Resort. You will find wedding packages that include everything you need to make things a lot easier for yourself. Additionally, the options for your ceremony and reception are not only unique but incredibly romantic. I think anyone would agree that this location is perfect for the dream, fairytale wedding that you’ve always wanted to have for you and your husband to be. Did you like Grand Velas Los Cabos Resort? Check out more here.